We provide friendly customer service. 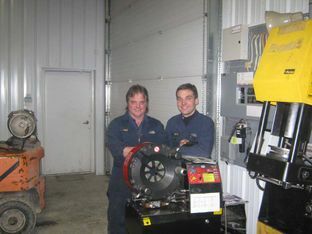 At-Tec Equipment has been repairing Sarnia-Lambton’s Mobile Hydraulics for over ten years. We are an authorized Gates Hose and Fitting Distributor. Together with Gates, we excel at providing fast, accurate and friendly customer service. We are your one stop shop for down time! Come in and meet our Awesome Team / Family! We know our business. In order for hydraulic equipment to operate, it’s very important to ensure that each part of an assembly is matched with others in that assembly that can handle the same extreme working pressures, temperature ranges and fluid compatibilities that the assembly is required to withstand. Our experts at At-Tec Equipment Ltd understand this and will practice the highest level of attention-to-detail in the industry to make sure your machinery will soon be working again at peak efficiency. We won’t be satisfied until your equipment is performing as if it were brand new! We're successful because we care. If the fluid you’re using can’t flow to your tools, valves and actuators, you have a serious problem that may be getting worse by the minute, putting undue and potentially disastrous strain on your assemblies. Let’s take hoses as an example. Since hoses are fluid-specific (considering that different hydraulic fluids contain different emulsions or solutions), if the couplings or reinforcements of your hydraulic assembly are designed to handle one type of fluid, and your hose is designed to handle the other, the parts are not compatible, and won’t work for very long if assembled together.